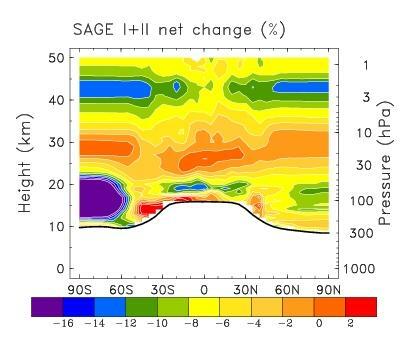 An update global ozone data set (1979-2005) derived from SAGE I and II data, plus polar ozonesondes, as described in Randel and Wu (2007). Annual average ozone trends for 1979-2005. Trends are calculated by regression onto a stratospheric chlorine proxy (equivalent effective stratospheric chlorine, EESC), and results are expressed as the net percentage changes in ozone during 1979-2005. A global ozone data set has been derived for use in global climate modeling studies. The data cover the time period 1979-2005 with monthly resolution, for altitudes up to 50 km. 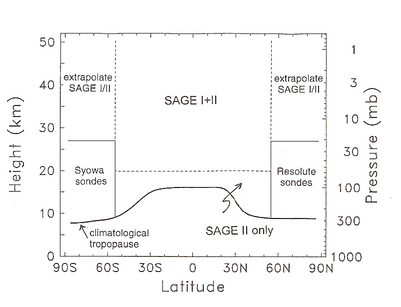 Interannual ozone variations are derived from a combination of SAGE I+II satellite data and polar ozonesondes (illustrated in the schematic below). The interannual changes are combined with the climatological ozone data set of Fortuin and Kelder (1998), to provide a complete data set. Monthly data are available on the ftp server at /sparc/ref_clim/randel/o3data/. The file reader_2005.f explains the data format. Data sources used to calculate interannual variability for the global ozone profile data set. Fortuin J. P. F. and H. Kelder (1998), An ozone climatology based on ozonesonde and satellite measurements, J. Geophys. Res., 103, 31709-31734, doi:10.1029/1998JD200008. Randel, W. J., and F. Wu, (2007), A stratospheric ozone profile data set for 1979–2005: Variability, trends, and comparisons with column ozone data, J. Geophys. Res., 112, D06313, doi:10.1029/2006JD007339. Please remember to send us a quick email with your feedback to gro.e1555873979tamil1555873979c-cra1555873979ps@ec1555873979iffo 1555873979. Thanks!